Living beside an ocean has its disadvantages. One of them being the occasional heavy squall that blows in from the east. Our Bowie city infrastructure and natural waterways can handle the normal rainfalls, but on those rare occasions we get more than the norm, some of that water will flow into people’s basements or places of business. 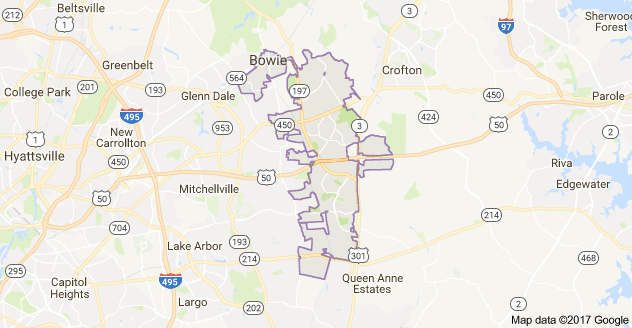 Fortunately, if you live in Bowie or surrounding areas, the experts at MD Water Damage Restoration are licensed, bonded, and insured professionals, trained to conduct emergency water extraction and damage restoration. Our teams can get your property fixed up in a timely manner. Call us at 1-888-743-3045 for water damage restoration in the Bowie service area. We are available 24/7 and we guarantee a response within 30-60 minutes. Living next to the Atlantic always bears the risk of rain and flooding that can bring water into your basement, causing a lot of water damage besides. However, natural events aside, water issues brought on by a faulty washing machine or old water pipes can also put a standing pool of water in your basement. When this happens, you can’t afford to delay. It’s urgent that you call in a crew of extraction and restoration specialists, and it must be done soon before the water ruins everything it touches or bring on secondary hazards, like black mold. Call MD Water Damage Restoration immediately, and we will be at your property ready to assess the situation and get to work. Since 2001, we have been remediating flooded basements and delivered quality water extraction and damage restoration service to residential and business customers in Bowie. Any kind of water emergency damages not only structural materials, but it can ruin furnishings and other possessions the water contacts. Damage to furniture, electronics, and appliances can lead to expensive restoration. Some items can be damaged beyond repair. A flooding event can cause the worst kind of damage to your home or business building. You must act soon to avoid the onset of secondary hazards that could risk your property and its occupants. Excess water must be removed and the affected areas properly dried and treated. Because of the greater risks, this kind of emergency should not be a do-it-yourself project. Mold – Black mold and other biohazards are often associated with water damage. Mold or any other kind of fungal infestation can flourish in hidden places that has excess moisture, oxygen and an organic surface of some kind, such as structural wood or some paper products. Also, if the water and its damages are removed but not treated properly, mold can still take root. Mold infestations can cause serious health issues, or can be fatal with prolonged exposure. Black mold is one of the more commonly known, and it produces airborne toxins that lead to respiratory problems, inflammation of the skin, nausea, and more. More serious conditions include hemorrhage, mental impairment, and memory issues. Bacteria – If broken sewage lines flood a basement or other parts of a home or business, this kind of emergency begins with water contaminated by bacteria. However, even pure water left standing for a couple of days becomes stagnated, filled with all kinds of micro-organisms that can lead to critical health problems. It must be removed and the affected area thoroughly sanitized. Biohazards and contaminants – Water running over yards, streets, and parking areas picks up dangerous contaminants such as oil and fuels from cars and trucks, lawn fertilizers, and animal waste. When this type of water flows into your home or business, it creates an unhealthful environment. You need a professional to remove this problem. Damage to your building’s structural components – The longer water stands, the deeper it soaks into the structural materials and content of your home. It can get under flooring, or into drywall and paneling, wood stairs, insulation, and anything else it contacts. A water-damage professional can ensure all standing water and dampness is removed properly, and restored to its safe environment. Building materials – Even brick, concrete, and hardwood will be affected by standing water over time as moisture works its way into even very small cracks and holes, which will ultimately weaken the material. A professional must use a special drying process to remove the risk of mold infestation. Carpets and carpet padding – Carpeting, rugs, and carpet padding are extremely vulnerable to water damage. If the extraction is done quickly after the flooding event and the water is not already contaminated, a professional can dry the material properly then safely sanitize and disinfect so that it can be restored to normal use. Loss of personal property – Prompt water extraction by a professional can reduce your losses dramatically. The longer water is allowed to stand, the more deeply it absorbs into furniture, boxes, drapes, and other materials. Our highly-trained experts will bring professional-grade equipment when you call us. We are available 24/7. If you have any questions or concerns call 1-888-743-3045. We will use a general set of procedures in our water damage projects although every job requires an individualized restoration plan. Full damage assessment – If water is still coming into the premises, our team locates the point of entry and fixes it. Then we will assess the water and all affected areas. Identification of flood water type – MD Water Restoration experts are IICRC-licensed and have the training to identify and safely extract any water type.We categorize water according to its source and the contaminants in it. Water removal – Heavy pumps will extract the water early in the process to minimize the damage to your property. With professional grade equipment, we check for hidden areas of moisture then dry them out. Classify the water damage – The flooded area of your property is assessed. Surfaces that require special treatment, such as concrete, brick, hardwood, etc., will also be checked for damage. Contents must be removed. Dry out of property and structure – State-of-the-art fans, electric panels, and dehumidifier are used to ensure all excess moisture is eliminated from the affected area. Restoration of property and contents – We clean and sanitize salvageable materials and contents; contaminated or other unsalvageable items are removed for proper disposal. Affected areas and its materials are cleaned with powerful detergents and antimicrobials to prevent mold infestations. Insurance claims support – We help with your insurance claim by providing all documentation of our process, including photos of the water-damaged areas before and after the restoration and detailed notes of our restoration process. MD Water Damage Restoration has handled a variety of water-related projects that entailed any number of water types. Burst or frozen pipes – Winter’s cold fingers can do terrible things to an insulated pipe. If it breaks, then you will have a mess in your home or office. Call us and we will pump the water out, ensure the affected area is dried, and restore the damage. Faulty appliances – Washing machines and dishwashers don’t last forever. A simple leak or busted water line can leave you with a problem in your home. We will remove the excess water, completely clean and dry the affected area, and restore the damage. Leaking pipes – Old worn out pipes in your basement or other areas of your home or business can lead to severe water damage—or biohazard—if it’s not thoroughly dried and cleaned. Our restoration teams check walls, floors, and other hidden areas for hidden pockets of moisture. Hurricane and storm damage – If city drainage and natural waterways can’t contain all the rain water in a storm, some of it might seep into your residence or place of business. Our professional-grade equipment can remove the water, and our professional techniques will restore the damages. Sewer line backup – When a sewage line backs up or breaks, this kind of disaster requires specialized handling by trained professionals. Don’t try to do it yourself. Our specialized techniques and equipment will ensure safe removal; also, your property will be thoroughly decontaminated with no lingering odor. Water leftover from putting out a fire – After a fire is squelched, that part of your structure which survived the blaze will have a lot of water damage. Our state-of-the-art equipment and products will clear out any standing water. Then the water damaged areas will be cleared out and restored. MD Water Damage Restoration has been serving customers since 2001. We know the stress our customers may be under from a water-damaged structure, and we stay focused on the need to get their lives back to a normal routine. If you live in the Bowie area, call us 24/7 and our certified restoration teams will be at your property within 30-60 minutes. Our teams have experienced all types of water damage restoration in our service area, including flood damage, flooded basements, and a broad scope of other water-related disasters.